In today's world with its multinationals and global branding, you sometimes forget the corporate relationships and bonds that were forged in the last century in our own UK domestic market. Although sadly some of these homegrown companies are now long gone. To onlookers one of the most interesting and glamorous industries was related to the cinema and with that whole "going to the pictures" experience - the films and their stars, the intermission adverts, the usherettes taking you to your seat in the dark, and most importantly for many, the refreshments. 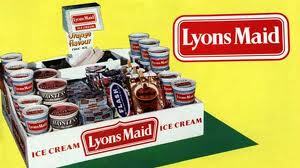 Lyons Maid ice creams and frozen lollies will no doubt be fondly remembered by many who can still remember those times, especially the usherettes with their trays packed full of goodies to buy in the interval. Buying a lolly or a tub of ice cream was part of going to the cinema and so naturally Lyons Maid had a close relationship with the Cinematographers Exhibitors Association (CEA) (who will soon be celebrating its own 100th anniversary). Over the years many organisations associated with the cinema industry attended the annual CEA conferences. But together with Pearl & Dean the cinema advertisers, Lyons Maid was a regular stalwart of these conferences. Indeed every year, Lyons Maid sponsored "La Gala Lounge", an ice cream parlour where delegates could order teas & coffees as well as all manner of ice lollies & ice creams, including concoctions such as the fabulous Knickerbocker Glory, served by the Lyons Maid hostesses. And believe it or not there was a Lyons Maid Sindy made for the 1967 CEA conference in Brighton. She was dressed in a bespoke replica copy of the 1967 Lyons Maids hostesses' silver blue trouser suit outfit and she was given to the wives of delegates at the prestigious Lyons Maid La Gala "London Melodies" awards dinner held at the Hotel Metropole on 19th June 1967 from 8pm-2am. This was an important event for Lyons Maid as the CEA President Harry Roelich was presenting a framed citation to John L Massarella, Managing Director of Lyons Maid, and awarding a silver cigarette box to Stanley van Gelderen, their Public Relations man. If you look at the British Pathé film clip (don't forget to put the sound up) you can see the Lyons Maid hostesses at the opening ceremony and the decorated table menus printed onto the usherette tray held by a Lyons Maid hostess (see inset photo right). Double-click on the photo to go to British Pathé to see the 1967 Brighton CEA Conference Awards Dinner footage. "Just before midnight struck Lyons Maid hostesses presented a gift to every lady. 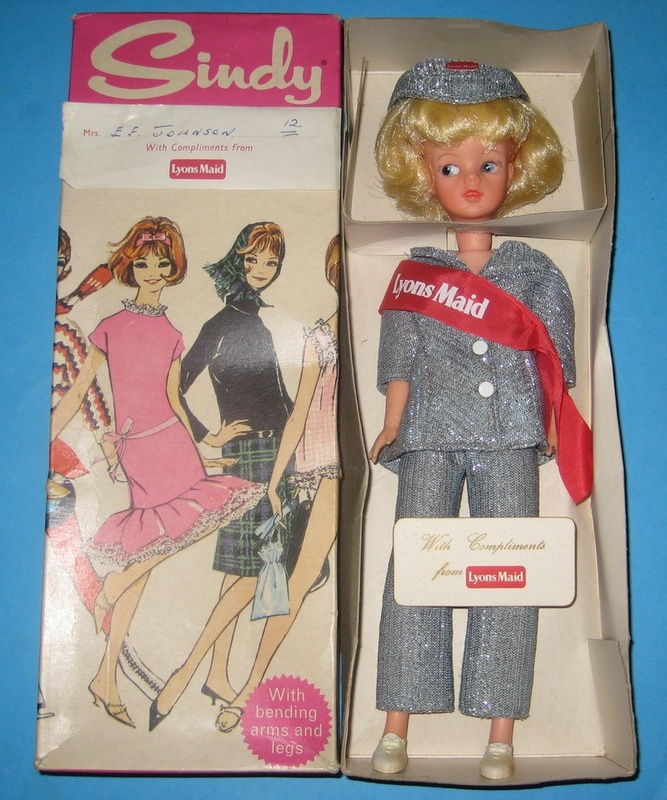 This was a Sindy doll dressed in the new Lyons Maid hostess "with it" costumes, a blue Lurex trouser suit with matching cap and red sash and badge. This glamorous outfit won acclamation in La Gala where the hostesses were kept busy serving ice cream and sundaes and other light refreshment throughout the five day conference." Isn't she lovely, as you can see, she is wearing a beautiful silver blue trouser suit with flat white poppers, a matching peaked cap bearing a Lyons Maid badge, and she is wearing a red & white Lyons Maid sash to match their corporate colours. She still retains her white Sindy sneakers and under her cap she has her original red headband. She doesn't have any markings on her neck and from the look of her we'd say she was a 1960s Hong Kong Sindy, which would be right for 1967. When we were first asked about this doll she was completely unknown to us, but we could see she was genuine and after researching her and finding the British Pathé newsreel, we contacted the CEA. They put us in touch with Lydia of Pearl & Dean, and now we even know who this Sindy was presented to. As you can see from the box, she was given to Mrs E F Johnson. We know Mr & Mrs E F Johnson were seated on table 12 at the awards dinner and that Mr Johnson was the General Manager of a group of cinemas in Leeds - the company used to be called Associated Tower Cinemas and later Whincup Circuit. 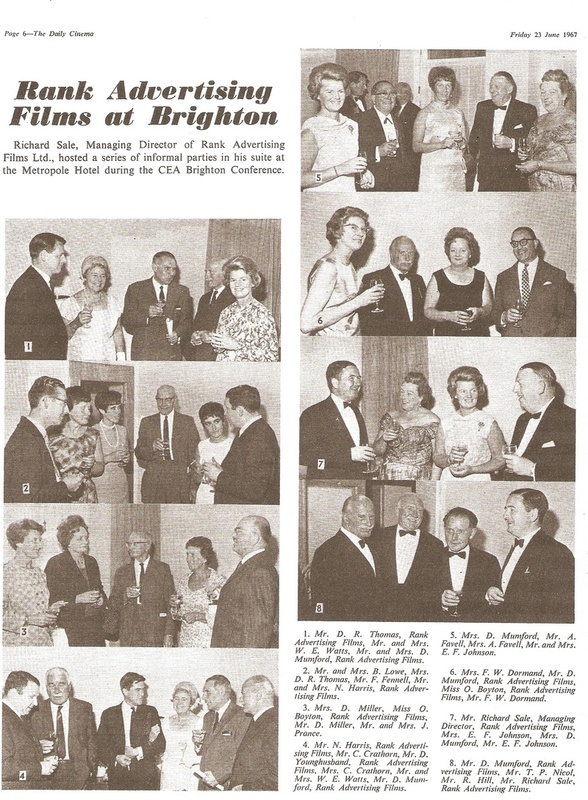 Shown below are Mr & Mrs E F Johnson as pictured in "The Daily Cinema" attending an informal drinks party with the Managing Director of Rank Advertising Films Ltd at that Brighton Conference. And here is yet another association with Sindy and our own social history.